Cleaning and disinfecting a restroom correctly is crucial to the success of any janitorial operation. Of all the areas in a building that can make or break a cleaning service, restrooms are up there with front entrances, breakrooms and CEOs’ offices. A bad first impression for a visitor or tenant can result in increased scrutiny, as well as possible loss of the contract. According to a Contracting Profits survey, 55 percent of facility executives deem clean and stocked restrooms to be the most important results of a cleaning service. When cleaning restrooms, janitors need to wear the required personal protective equipment (PPE) and make sure all items are in working order. If unsure what PPE to use, check with the SDS (Safety Data Sheet) and/or a distributor. Failing to provide the correct equipment can result in not only injury, but also possibly an OSHA fine. After placing wet floor/hazard signs at the entrance, the janitor should knock on the door announcing himself. This is very important for a person entering a different gender restroom. Give time for a response and proceed with caution since a patron may not have heard or may not have responded loudly enough for the janitor to hear. When possible, use a barrier to keep people out during cleaning. Upon entering the restroom, make note of any and all apparent odors. An experienced janitor can readily differentiate between old, built-up odors and recent ones. Janitors shouldn’t let aerosols and deodorizes lull them into false complacency since products can mask a restroom in need of deep cleaning. Start by applying disinfectant/sanitizer to all touch-points including toilets, urinals, sinks, faucets and handles. Be careful not to damage the paint/enamel of walls or other surfaces by testing the cleaning in an inconspicuous area first. The reason for applying the disinfectant early is to allow it maximum dwell time. Next, inspect and dust vents, tops of partitions and other high areas, allowing any debris to fall before sweeping or mopping floors. When possible, use a vacuum dust wand for this task. Then sweep floors and pick up large trash giving special attention along walls and corners to reduce build up. Inspect and restock all paper supplies, including toilet tissue, paper towels, seat covers and sanitary napkin bags. 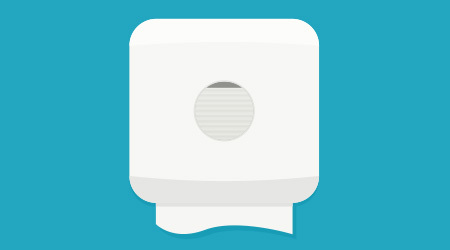 Do the same for hand soaps and other expendable supplies, such as hand sanitizer and odor control dispenser refills. After addressing dispensers, damp wipe/polish all metal fixtures and mirrors, being sure to leave surfaces clean and free of spots. 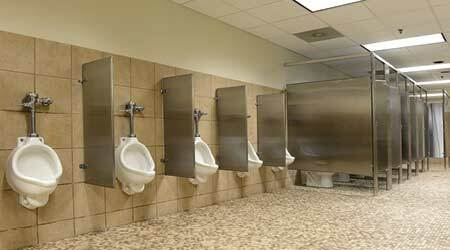 Finish cleaning/disinfecting toilets, urinals, sinks and other touch-points both inside and out. Give special attention to rinsing and drying toilet seats to reduce chance of injury from chemical burns. Using a properly mixed solution of either detergent/disinfectant/enzyme cleaner, mop the floors, being careful not to apply a ring of solution along walls that can build up over time. On occasion, double wet mop floors by allowing solution to soak for a period of time and pick up with a wet vacuum unit or at least a clean mop with clean rinse water. Periodically wash walls to eliminate build up and soiling. It is best to apply solution from bottom to top, and rinse from top to bottom. Pouring water or a mixture of cleaning solution or enzymes down the floor drain can deal with any odors while blocking sewer gas. Before leaving, pull the trash and replace can liners. Always inspect your work and remove safety signs once the floor is dry and ready for use. If a restroom smells dirty, it is dirty. Using the wrong tools or failing to properly train janitors are key factors in determining a poor outcome of restroom service. Charles “Mickey” Crowe has been involved in the cleaning industry for more than 35 years. He is currently a trainer, speaker, consultant and contributor to Contracting Profits’ website, www.cleanlink.com.